The White Lake Basin has long been a priority for conservation efforts in the Okanagan. The primary role of the protected area is conservation: to protect the very hot and dry grassland, open pine forest and alkali ponds and rock outcroppings of the Southern Okanagan Basin ecosection. The protected area captures the full elevational gradient from lakeshore to mountain top and provides important habitat for many of British Columbia’s red and blue-listed wildlife, plants and plant communities. 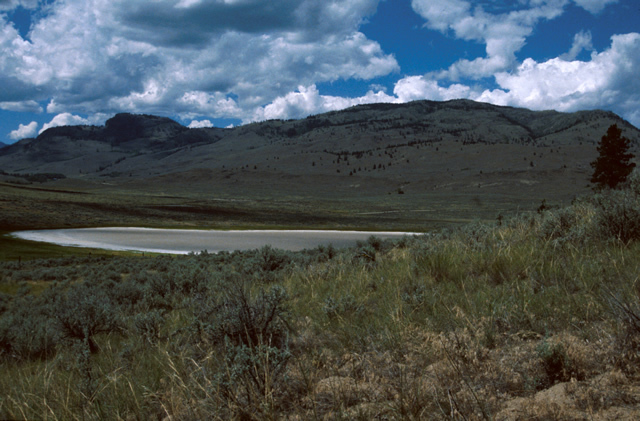 White Lake Grasslands Protected Area is contiguous with other protected areas around Vaseux Lake, thereby forming a significant large conservation area. The extremely hot, dry Okanagan climate can result in overexposure to the sun. Visitors should use a sunscreen and wear a hat during long periods in the sun. Hikers should bring plenty of water (there is none available in the park) and consider scheduling their activities to avoid the heat of the day. The use of motor vehicles (ATVs, motorbikes, and 4-wheel drives) is prohibited in the protected area. Camping is prohibited in the protected area. Scouts Canada have special permission to continue using the southern portion of the protected area for camping. White Lake Protected Area encompasses the height of land west of Okanagan Falls from Mt. McLellan and Mount Hawthorne, wrapping around the vineyard, Green Lake and the community of Willowbrook as it continues down the west side of Vaseux Lake from Mt. Keogan to McIntyre Bluff and over to Myers Flats. The eastern face of Mt. Parker, overlooking St. Andrews Golf Course is also protected. The protected area does not include White Lake itself or the lower elevations of the basin; these are managed by the Nature Trust of British Columbia. Access to the protected area is via Green Lake Road and Fairview-White Lake Road. The nearest communities are Twin Lakes, Willowbrook, Oliver, Penticton, Okanagan Falls. History: White Lake Grasslands Protected Area was established on April 18, 2001 as a result of the Okanagan-Shuswap LRMP process. Cultural Heritage: A rich cultural heritage is evident in this grassland area, including eight upland archaeological sites, rock shelters and pictographs that act as reminders of First Nations use of the area. European history is also in evidence. A portion of the Fur Brigade Trail is found within the protected area at Myers Flats and there are house pits, a cache pit and other signs of early European settlement. Conservation: The Okanagan Valley, with its hot dry summers and mild winters, is a popular place for human settlement. Unfortunately, development has placed increasing pressure on the environment. The dry grasslands and open pine forests of the South Okanagan are one of the four most endangered ecosystems in Canada. White Lake Grasslands Protected Area plays a very important role in protecting mid-elevation grasslands with old growth stands of Ponderosa pine required by the White-headed woodpecker. It also provides important mule deer winter range and Class 1 California Bighorn Sheep winter range and lambing areas. Wildlife: The protected area abounds with endangered wildlife. The area contains many red and blue-listed species such as two amphibian species, five reptile species, fifteen bird species (including the feature species of the park, the Whiteheaded Woodpecker), eight mammal species (including badger, and three bat species), two insect species and three plant species in the park. Cycling is permitted. Recreational mountain bikes are allowed on designated roadways. Bicycle helmets are mandatory in British Columbia. The number of wilderness trails in the protected area is limited. The trails are unmarked and require familiarity with the area as well as map and compass skills. The White Lake Trail begins on the Nature Trust property south of the lake. There is a gravel pullout off Fairview-White Lake Road with parking for a limited number of vehicles. An information shelter is at this site. The trail passes through a small grove of aspen as it heads southeast into the park following a chain of alkali ponds. The small pass runs between rock bluffs to the north and a treed ridge to the south and overlooks Mahoney Lake and the rugged, rocky terrain of the northern section of the protected area. The trail winds its way down to Mahoney Lake crossing a dam and entering open Ponderosa pine forest. Another small pond is passed and the trail becomes a dirt road. A branch of the road veers north and travels diagonally through the park roughly following Kearns Creek. This is a much longer route that should not be attempted unless prepared for a full day of hiking through dry, rugged terrain. The trail/road follows the western shore of Mahoney Lake and comes out at Green Lake Road on either end of the lake. Allow two hours to reach the gate and parking at the north end of Mahoney Lake. For a longer hike, the trail continues across Green Lake Road south of Mahoney Lake to the top of Mt. Keogan. Unmarked hiking trails also lead to the top of McIntyre Bluff. Access to these trails is through the private property of Covert Farms and the Willowbrook Society and their permission is required. Horses and horseback riding are permitted. The open pine forest and grasslands are great for riding, though there are few designated trails. The majority of the protected area is open to hunting as listed in the BC Hunting & Trapping Regulations Synopsis. The exceptions are the Seacrest Toboggan Hill and the Boyscout Camp. There is no motorized access in the protected area, Horses may be used. Access to much of the protected area is through private land. Anyone hunting in British Columbia must have an appropriate licence. Check the BC Hunting Regulations for seasons and closures. Bird watching is a popular activity in the protected area, due largely to the presence of so many rare species. Highlights include the Long-billed curlew, White-headed woodpecker, and Yellow-breasted chat. Popular sites are Kearns Creek, Mahoney Lake, Rattlesnake Lake and McIntyre Bluff. The southernmost portion of the park, on Seacrest Road, was traditionally used for tobogganing by locals.